It is beautifully designed with crisscross diamond and vertical cuts, with a starburst on the bottom. These elegant crystal glasses have an amazing sparkle! They weigh a substantial 12.7 oz. 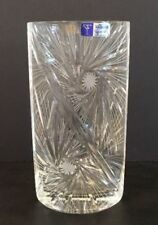 This Gorham crystal pattern is discontinued. New ListingVintage Heavy Crystal Paneled Cascade Design Cambridge? Glass Floral Vase 9 1/4"
There are a few manufacture flaws to the glass. Only gives it a - one of a kind - character to it. (Check photos). Glasses Floral. Beautiful set of 6. A set of four (4) cut crystal red wine stemware glasses from premium maker, Spiegelau of Germany. Enjoy over 500 years of glassmaking perfection with this red wine set! These glasses are perfect for full-bodied red wines with high acidity and moderate tannins, such as bordeaux, burgundy and pinot noir. 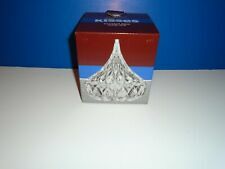 4 GORHAM CUT CRYSTAL 10 OZ. This is a set of 4 heavy crystal highball glasses by Gorham in the King Edward pattern. These glasses sparkle beautifully! and weigh a substantial 1 lb. 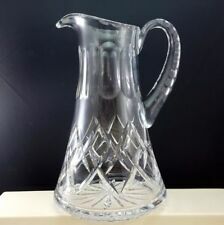 This Gorham crystal pattern is discontinued. T his is for a set of 4 cut crystal water glasses from Godinger in the Caitlin pattern.They re discontinued now and have deep cuts with criss-cross cuts and a multi sided stem with a star foot. They are marked with an etched Gorham. This crystal has been displayed in my china cabinet and not used. They were obtained in 1979 and this pattern is discontinued. These elegant cordials are clean, sparkly and in very good condition! Gorham Lyric Bowl. This bowl is about 6" wide and 2" deep. The crystal is in mint condition. See pictures for details. ROGASKA CRYSTAL "GALLIA" WINE HOCK GLASS (4 AVAILABLE). Vintage Atlantis Full Lead Crystal Square Decanter w/ Label 10”Tall The decanter is in excellent used condition. No chips, cracks or stains. It appears to be unused. It is marked underneath. Hand made in Portugal. BRAND NEW- VINTAGE ROYAL BAVARIAN CRYSTAL WATER GOBLETS (SET OF 6) NOS. Shipped with USPS Priority Mail. This is a beautiful piece in Great Condition I found 2 spots that are a little rough tried to photo but you really cannot see them. Each glass is very nicely detailed with vines,floral as well as grape pattern. Each glass is in excellent condition with clean and clear glass. 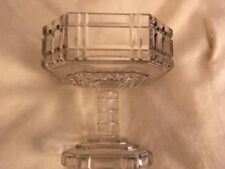 6 GORHAM 1831 CRYSTAL Tea Light Glass Candleholders New In Box 3"
6 GORHAM CRYSTAL Tea Light Glass Candleholders Original Box 3". 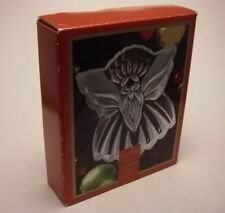 This is a Beautiful New Never Used 24% Full Lead Crystal Stylesetter Riviera Candy Box Made in Yugoslavia in Original Box. The box shows a little wear. It is about 10" Tall & 6" Wide. This is a Very Nice Piece of Crystal. The vase features a triangle form with a thick crystal ribbed design. The glass has wonderful clarity and brilliant. It is signed on the bottom "Rogaska". Available is a lead crystal vase by Rogaska, one of the leading producers of crystalware in the world. Oleg Cassini signature is etched on the base. This is a red and clear crystal German vase. It has 6 panels to it. The red panels have a floral design on them. The top is scalloped and the base has a large star design on it. The original sticker is still attached. New ListingVintage Rosenthal Crystal Studio Line Structure Bowl 8 1/8"
Up for sale is a crystal bowl made by Rosenthal of Germany. This is in the retired Structure pattern (1969-1980) from the Studio Line. This nightcap decanter is in excellent condition with no defects and is very rare. It is 5 3/4" tall overall and 2 1/4" square. This looks slightly smaller than a wine glass. They are a pair looks about 6 1/8" high and 2 3/4" across the top. Fabulous vertical and horizontal cut lines on 2/3 of each glass. Heavy and substantial, but feel very good in hand. Each weigh about 13 ounces. Gorgeous crystal sound when ding with finger. Etched on bottom base with “Lenox logo, Lenox, USA”. This is a very old vintage open and footed candy dish. It has scalloped edges at the top and lovely overlapping leave and flower designs. It stands 5" tall and is in good condition no chips or cracks. (3) Water Goblets. (3) Wine Glasses. Gorgeous Hofbauer Crystal Papillon Footed Bowl With Frosted Butterflies . Condition is Used. Shipped with USPS Priority Mail. 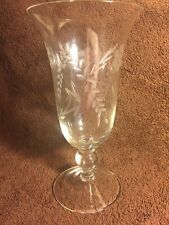 RALPH LAUREN GLEN PLAID WINE GLASS 8 1/4" GOBLET LEAD CRYSTAL GLASS. NEW IN BOX WITH STICKER. EXCELLENT CONDITION. SIGNED ON BOTTOM RALPH LAUREN (WHITE ETCHED BLOCK SIGNATURE ON BOTTOM). Wonderful pair of authentic Waterford Lismore crystal sherry glasses. Crafted of hand made full leaded crystal. Each with "Waterford" etched on bottom. Pristine condition. VINTAGE WEDGWOOD Full Lead Crystal Bowl Yugoslavia GREAT CONDITION. WEDGWOOD LEAD CRYSTAL BOWL, made in Yugoslavia, stamped at the bottom. Never use, has original sticker on. See pictures. Nachtmann Helena SET of 6 Crystal / Old Fashion / Water / Glasses / Wine / Juice. Condition is Used. Shipped with USPS Priority Mail. "COLONY" Crystal ~ Hand Made in Romania. Candy Dish Potpourri Bowl Treasures. Lovely Etched Crystal Clear Glass Bowl with Lid. Delicate Etched Flowers and Lovely Swaying Leaves. Original Silver & Black Sticker. Here's an elegant "birdbath" balloon wine glass in the Herringbone pattern by Ralph Lauren. There is an etched Ralph Lauren maker's mark on the top of the foot.